All earnings on your contributions grow tax-free and stay tax-free, as long as the funds are used for qualified expenses, including elementary, secondary, and post secondary education. Covers expenses for virtually all accredited public, non-profit, and private institutions: elementary, secondary, and post secondary. Eligible elementary or secondary schools include any public, private or religious schools. and your child has until age 30 to use the funds and receive the tax exemption. Transferable to eligible family members. 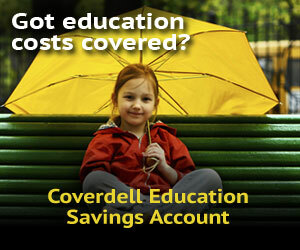 The Coverdell Education Savings Account is NOT a retirement arrangement. It is a trust or a custodial account created only for the purpose of paying the Education Expenses at a qualified institution of the Designated Beneficiary of the account. Who is the Designated Beneficiary? The designated beneficiary is the child on whose behalf the trust or custodial account has been established. Education expenses include qualified elementary and secondary education expenses, in addition to post-secondary higher education. Tuition, Fees, Books, Supplies, Academic Tutoring, Equipment, Special services in the case of a special-needs beneficiary, and Room and board if the beneficiary is at least a part-time student at an eligible educational institution. The depositor’s Modified Adjusted Gross Income (MAGI) is within IRS guidelines. The maximum contribution per year per child is $2,000. Contributions are NOT permitted in the year the child turns 18 or any year after. Contributions will be accepted until the tax filing deadline, usually April 15th, for the previous tax year. See our IRA Service Center >> for additional information. for qualified educational expenses at qualified educational institutions. Non-qualified distributions will incur an IRS penalty of 10% and taxation.